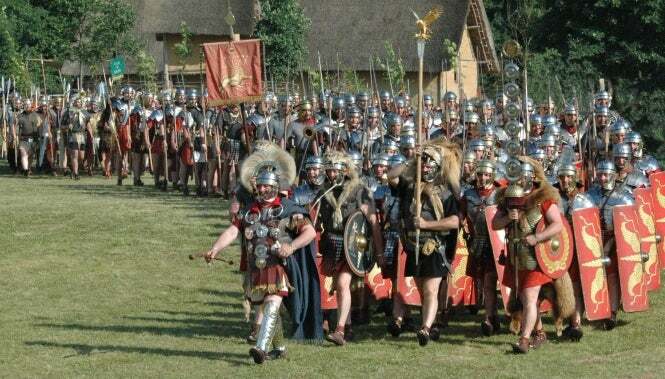 The outfits may cost €3,000 and the lifestyle might see you camping without showers over a weekend, but historical re-enactments are luring more people onto ancient battlefields and stimulating a renewed interest in history. Re-enactors are keen to point out that it has nothing to do with fantasy role-plays, code-medieval fayres or dressing up. Serious re-enactors (reconstituteurs in French) research their period of history in minute detail and then re-create the original as closely as humanly possible. Alain Nice is something of a leader in French re-enactment, having fallen into it as a result of his passion for archaeology. “I studied history and archaeology at Amiens University,” he said. In 1981, while ploughing a field in Goudelancourt-lès-Pierrepont (around an hour north of Reims) in the Aisne, a farmer came across some ancient relics. They dated to the Merovingian period, which lasted 300 years, from AD 457 to 754, during which the Merovingian dynasty (often called “the long-haired kings”) ruled a large area of what is now France and Germany. The most famous of them was probably Clovis I, who united all of Gaul. It was decided to conduct an archaeological excavation of the area. Alain Nice volunteered to lead the dig, which eventually continued for 20 years. The area turned out to be a cemetery, containing 458 undisturbed graves, each complete with the deceased person’s belongings. The objects found included kitchen items, working tools, jewellery, arms, and armour. In 1991, Alain founded a museum, the Musée des Temps Barbares, in nearby Marle to house them all. The work was practically a full-time job, although Alain was always just a volunteer, and for a living, worked full time in school administration. 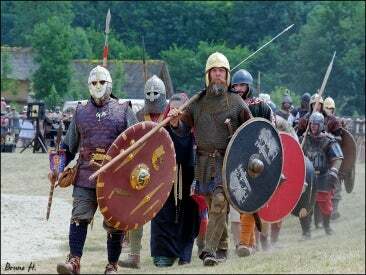 “We developed Merovingian Days as real living history, to show people how they lived back then, and bit by bit we started creating bigger re-enactment events,” he says. Five years ago, Alain realised that people did not know much about the French Revolution, so he founded a re-enactment group called Carmagnole Liberté to fill the gap. “We just thought it was crazy that the period wasn’t represented by re-enactors,” he says. The group is now in demand to put on re-enactments all over France. Re-enactment is quite new in France, having only really developed over the past 15 years, compared to the UK, where it has been established since the 1970s. 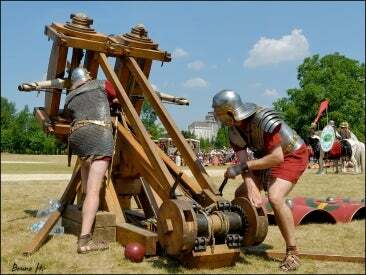 “When we did our first big re-enactment of the Roman period in 2001 we invited the biggest, most well-known and oldest re-enactment group in Europe, Ermine Street Guard, founded by Chris Haines in 1972, to come over from the UK, but now there are many more good-quality French groups,” said Alain. Reconstruction, he added, was not “entirely innocent”. Lots of people join French revolution groups because they are nostalgic for the ancien régime and regret the passing of the French royal family. Whatever the motive, re-enactment is an expensive hobby. Uniforms are costly to buy, and armour is particularly expensive. He admits however that sometimes, despite the attention to sartorial detail re-enactors can look curiously modern. One of the biggest living history research projects in France is the building of the fortified medieval castle at Guédelon, 45 minutes south-west of Auxerre, Yonne. The construction is being carried out exactly as it would have been in the Middle Ages, and the aim is to discover how these massive fortresses were built. In order to house the workers and workshops such as rope-making, a medieval village has been constructed, as well as a flour mill, and the whole site can be visited from March to November. At first glance, re-enactment can look a bit male-dominated, but if you look closer, you will soon realise that it is not the case. A good many of the 6,000 re-enactors at Waterloo in June 2015 (for the 200th anniversary of the Battle of Waterloo) were women, and not all of them were re-enacting cooks or camp-followers. Many of the “private soldiers” on the field, and even more of the cavalry officers, were in fact women. Different groups take different approaches. Some will not let women re-enact men, but many others do not have a problem with it, so if you want to re-enact a soldier, just ask before you join a group. There are also some all-female groups presenting period dances and balls, cooking demonstrations from various periods. 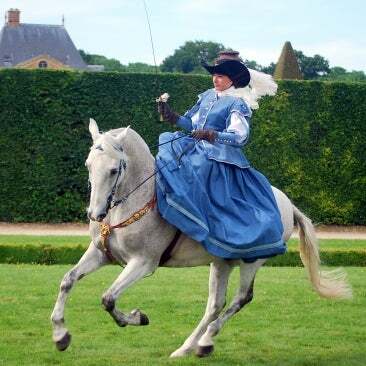 Ecuyères et Licorne, based in Saumur, Maine-et-Loire, consists entirely of horsewomen who stage re-enactments from a variety of periods, wearing authentic clothes and using authentic horse leathers. Founder Catherine Boucheny says the group is the only all-female equestrian re-enactment group in France. “It’s true the re-enactment world is a bit male dominated, especially when it comes to active roles,” she says. “This is partly because in the past women didn’t play much part in battles, which tend to be the most popular re-enactments because they are so spectacular. “In the past, powerful women were often mistresses, or rich enough to act freely, like Eleanor of Aquitaine, Catherine de Medici, and Isabelle I. She says women with children, even today, often find themselves at home, while their husbands are out pretending to be Roman Legionaries all weekend. Reconstructions often involve camping out for days on end in locations with no formal infrastructure (showers/lavatories) which can put some women off.